In Frankfurt, Annette and I are members of a group of wine and food aficiniados that meets about once a month in a top restaurant. In August, we had dinner at Weinsinn. 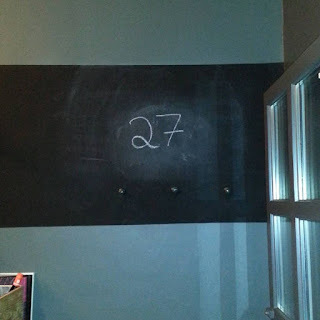 There were six of us. We had 7 bottles of wine. We all had 4 courses. We spent Euro 175 including tax and tip per person. By PETE WELLS - October 22, 2013: When young lovers dream of a romantic European dinner in a back-street hideaway packed with locals, those back streets tend to be in Paris or Florence, not Düsseldorf or Nuremberg. When thrill-seeking diners book long-distance travel to taste some pathbreaking chef’s strange new inventions, their planes land in places like Barcelona or Copenhagen, not Leipzig or Dresden. Although the 2013 Michelin Guide paid lavish attention to Germany, awarding 3 stars to 10 restaurants there, neither those restaurants nor their chefs are household names in any country but their own. When Germany flexes its economic muscle, other countries jump to attention. When it shows off its gastronomic power, they shrug. Anytime the world seems to have made a secret pact to ignore a subject, curious minds grow even more curious. So off I went last month on a brief but industrious eating tour of Germany. I traveled to three of the cities foreigners are most likely to visit, Munich, Frankfurt and Berlin, making reservations in relatively new restaurants. None of them were especially luxurious or expensive compared with the rarefied dining rooms that are catnip to the Michelin Guide. German chefs tend to play a long game, honing their craft in the same kitchen for decades. Coming from New York, where chefs will put a restaurant on their résumés after working there free for a few weeks, I was deeply impressed by the German dedication to putting down roots. But I was especially interested in seeing where the country’s restaurant scene may be going next, so I restricted myself to places that had opened since the start of this decade. Around the same time, my colleague Frank Bruni was pursuing a similar assignment in China, following similar rules. Unlike me, he stuck to the rules. I bent them to write about a very good meal I had in Frankfurt at Weinsinn, which opened at the end of 2009. 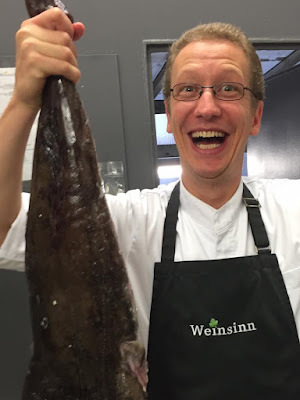 My rationale: In its first months, Weinsinn was a wine bar, and didn’t begin to evolve into a restaurant until it hired its current chef, André Rickert, the following year. Mr. Rickert has a modernist’s skill set and a modernist’s talent for combining the serious and the playful. Look what he does to ratatouille. Even its fans have to admit that the dish, a lump of stewed vegetables mired in a tar pit of olive oil, is usually no great beauty. Mr. Rickert’s version is a colorful, bright, edible garden, a field of couscous across which he plants black olives, shards of feta, a bright green mound of basil ice cream and warm cherry tomatoes that dissolved into sweet pulp on my tongue like berries in a pie. The ingredients were strewn all across the plate, but the flavors were firmly rooted. That was the case, too, with a dessert of late-summer damson plums that appeared in three guises: stuffed into a tender dumpling, frozen into sorbet and poached with cinnamon syrup. 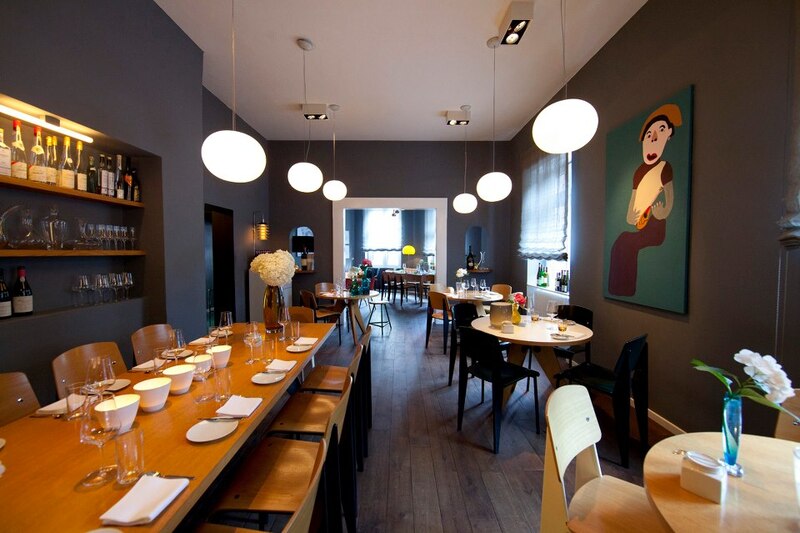 Weinsinn is compact, with only 35 seats in two small dining rooms. So is Mr. Rickert’s menu of three appetizers, three main courses and three desserts. The wine list, on the other hand, goes on for page after page, although there is a simpler way. We asked the sommelier, Jens Gabelmann, to choose for us. He sized up our table at a glance and brought us just the wine we might have asked for if we had been able to put our wishes into words. Weinsinn is perpetually full but not a scene; all the action is on the plates and in the glasses. The owners, Matthias Scheiber and Milica Trajkovska, his wife, say they borrowed the idea of serving serious food and drink for reasonable prices in a lively, informal room from French places like La Régalade. “The bistronomy movement does not exist in Germany,” Mr. Scheiber said. Traditionally, he continued, restaurant cooking in his country isn’t taken seriously unless it “comes out of hotels” with highly formal dining rooms. Kein Wunder, dass diese Adresse so gefragt ist: Hier geht es lebhaft zu, stimmig die moderne Einrichtung, wirklich toll die ausdrucksstarke und angenehm geradlinige Küche! Und dazu gibt es über 200 Positionen Wein. Mathias Schreiber: Our wine list now comprises more than 250 entries, including numerous big names, but also valuable insider secrets, thanks not least to the current generation of German winemakers. 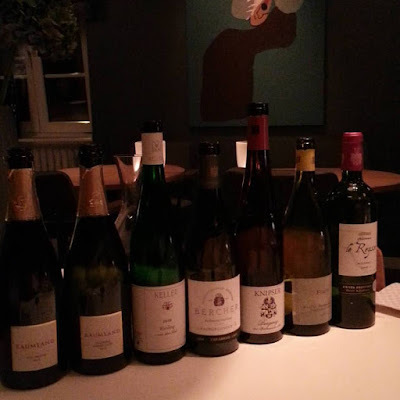 We chose the following 6 wines, all German except for the last bottle. Le Reysse, however, is German-owned. Most likely, this was my last dinner at the Weinsinn at its current location. Weinsinn is closing its doors at its current location at the end of September and will reopen a few weeks later in the Weserstrasse, close to the Willy Brandt Platz. 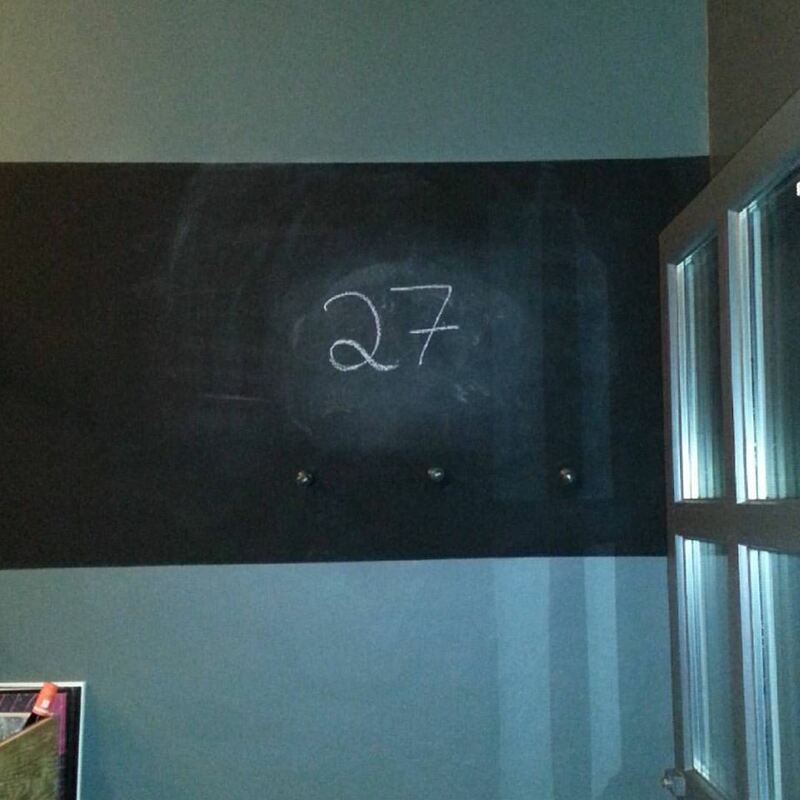 The 27 written on a blackboard at the bar of the Weinsinn at the night we were there indicated the number of remaining evenings left at the current location. Fred Merwarth, co-owner and winemaker of renowned Hermann J. Wiemer Vineyard in the Finger Lakes Region, was in Washington DC. Annette and I attended a winemaker dinner with Fred Merwarth at trendy restaurant/ wine bar Proof in downtown. Chef Austin Fausett built a super five-course tasting menu paired with the estate's beautiful wines, introduced by Winemaker Fred Merwarth. Hermann Wiemer has been a viticulture and winemaking pioneer in New York since he emigrated from Bernkastel, Germany in the 1960s, and the winery today remains a leader in the Finger Lakes for both wine production and vine propagation. Hermann was born to make wine. His mother’s family had over 300 years of winemaking experience in the Mosel, and his father was responsible for restoring vines in that region after World War II. Hermann grew up learning to graft vines by hand with his father before attending prestigious German winemaking and viticultural institutions. Since 2007, the winery has been run by Hermann’s longtime apprentice Fred Merwarth and the agronomist Oskar Bynke. Fred works to further Hermann’s vision by precise and thorough vineyard management and winemaking, while Oskar focuses on winery operations. The wines of Hermann J. Wiemer are stunning, pure Rieslings that speak of Seneca Lake with more than a little reference to the Mosel. The grapes are grown in three distinct estate vineyards that take advantage of the various microclimates and aspects of the western shore of Seneca Lake. The original 1976 vineyard, HJW, is where the winery resides. The Josef and Magdalena vineyards are about 10 miles north and differ greatly in slope, soil, and vine age. From the Dry Riesling which blends the vineyards together to the single vineyard offerings, Hermann J. Wiemer deserves a place amongst the great wines of not only America but also the world. Thanks Morgan, Austin and Fred for world class service, food and wine.